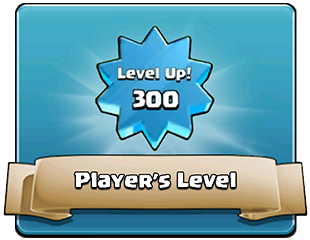 The Player’s Level is an indicator of your Progress in the Clash of Clans game. As you gain Experience, your level increases. First you need 30 to go to the second level. At each new level (from 2 to 200 ), the amount of experience you need to advance to the next level increases by 50. Between levels 201–300 the amount of experience you need to advance to the next level increases by 500. Beyond level 301 , the amount of experience you need to advance to the next level increases by 1,000. It is currently believed that the theoretical maximum level is at least 400 . The player named Brandon (TimeForShady in the forum) was the first person to reach Experience Level 300. The Player Level mean very little in Clash of Clans. A common mistake new players often make is thinking that level has a factor in matchmaking or loot, it does not. Trophies are the sole factor in matchmaking, and Town Hall level is the major determining factor for available loot. The only thing level affects with regard to gameplay is Decorations as they have a minimum level requirement to be unlocked.